“See this? 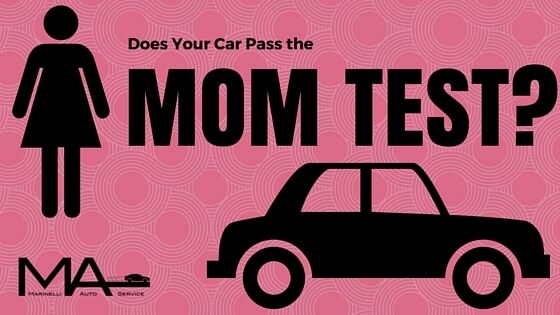 It does not pass the Mom Test,” Andrew told me one afternoon pointing at some rusty doo-hickey as he crouched beneath a vehicle. He explained and it made sense to me…and made me wonder if the Mom Test isn’t what’s missing in the auto mechanics industry. You see, when we opened Marinelli Auto Service in January, it was the start of what we both hoped, and still hope, would create a small revolution in the big world of auto mechanics for our customers. Let’s be completely honest – people generally don’t trust mechanics. I can’t tell you how many times I’ve heard someone say of an auto mechanic, “He/she ripped me off!” A good number of you have probably said it or wondered about it at some point or another. Mechanics have a bad rap and we’d like to see that change for those who are honest, doing things right and don’t deserve the stigma so many before them have left you. We know that we, alone, cannot change the reputation of the whole industry…but we hope to at least change it for those who come through our shop – one car, one customer at a time. We want to be sure everything we do for you is good enough for Andrew’s mom (and Andrew loves his mom!). What Went Wrong in the Auto Mechanics Industry? As more technology was implemented, the automobile evolved from a basic machine (by today’s standards) to one of great complexity requiring a myriad of parts, computers, and fluids to keep it running. More is involved to keep your grandparents, your parents…and now you, on the road. Only, you and your family have been left behind as the automobile has sped into the 21st century. Long past are the days when father and son can tinker on the family automobile on a Saturday afternoon just for kicks. Driveway mechanics is a grueling activity, of which only a select few succeed while still enjoying the process. Mechanics – or more appropriately, technicians – are now expected to be highly skilled laborers requiring countless tools, expensive equipment, and knowledge databases to get the job done right. The average person has little time, money, or capacity to achieve this as a hobby. So, the hope is that they can trust their auto technician to care of them and their vehicle in a way they would want their mom to be treated…but this has not been the experience of many. As the complexity of automobiles increased, the strain of the heightened demand was felt by technicians and business owners alike; the integrity of the industry slipped to the wayside and moms weren’t someone’s mom anymore – they’re just some woman holding the purse. Cash, check, or credit, ma’am? Promises of fast and/or cheap surefire fixes lure you into a shop only to return again for over-priced or unneeded repairs later. You decide to try a different shop, a different mechanic, and then another; all the while becoming disillusioned to what it really is to be treated right by a mechanic. Then, when you find a new shop and you think this is the one, you still aren’t sure whether or not you can trust them. Our goal, then, is to give you confidence in making decisions for your vehicle. We want to help you understand what maintenance or repairs are needed and help you prioritize the urgency so you can budget. We want to be upfront with our prices. We also don’t want to add to your disillusionment by being the cheapest shop on the block with shoddy workmanship, but rather offering quality work and excellent customer service at a fair price. Andrew often says to me, “You reap what you sow,” and, “I just want to do the right thing.” And so he goes off to crunch numbers as he toils over the cost of parts and labor to determine a fair price for each job. And I, too, spend hours researching in professional automotive forums, passing ideas back and forth with Andrew, and listening to what our customers value so I can bring you a bit of truth about this industry and your vehicle. I hope to empower you with knowledge so you can make good decisions for your car or truck.